I am so happy that Autumn is here. Well, it's around the corner at least. I don't know about you but it's been an unusual summer and I am ready for some knits and I really miss my uggies!! Today's creative team design project is inspired by THIS gorgeous stitched leaves die in the Aunty Vera Scrap & Craft April Kit. 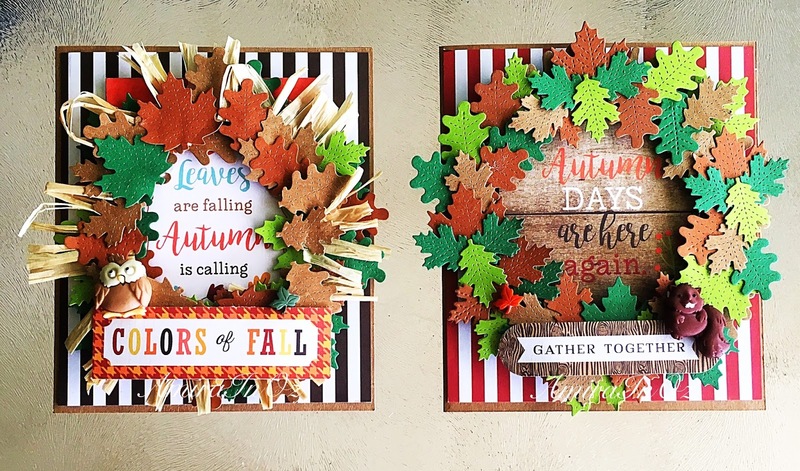 I dug into my card stock and die-cut a whole pile of leaves using craft, brown, light and dark green card. I was then overcome by an unmistakable urge to create a wreath out of these leaves and I just went with it!! Watch the process video to see me make this wreath! I then wondered whether adding raffia to the wreath would look any good- so I made another one and it adds a whole different look to it! These wreaths only measure approximately 4.5" x 4.5" so they really couldn't be used as home decor so I decided to turn them into cards. I reached for the Kraft card stock which measures scored in half. And I also cut a panel of the striped patterned paper from the April Kit. I also used one of the cut apart cards from the collection. I wanted to add a further sentiment to the card so I grabbed this banner from the Carta Bella Ephemera Pack from the Kit. To top it off, I used one of the critters from the button pack. I felt the squirrel went perfectly with the "gather" sentiment. Now for the raffia wreath card. I backed it up with the vertical striped brown patterned paper. You can tell here that it needs a little extra something! The banner and the owl top this card off perfectly! Now tell me, which one do you like better?